The Christmas season can have a big impact on business, with employers facing a minefield of potential pitfalls and challenges. In this short and sweet, two minute HR blast we look at a few of the HR issues that often arise at Christmas time … and how to avoid them! If you are shutting down for a short period over the festive season, hopefully you announced this earlier in the year and explained clearly to staff the number of holidays they needed to save for the Christmas closure. If you forgot to do this, then make sure you are more organised in future years! Messing staff around with holidays can really be really de-motivational. If an employee pushes back and says that they do not want to take holiday, be aware that you can legally enforce holiday. Should this occur you simply need to give employees notice that is double the length of the holiday they will be taking e.g. if they are taking 3 days, you need to give them at least 6 days notice. However, if they have run out of holiday for the year you cannot force them to take unpaid leave or force them to bring forward holiday entitlement from the next holiday year. It’s a good idea to review holidays around Christmas time, to make sure all your employees have either taken their holiday, are waiving it or, if your policy allows this, they are carrying over any remaining holiday. One day that always seems to cause problems is Christmas Eve. Many firms close early, but be clear in advance with staff whether they need to book a whole or half day off if they want the day as a holiday. Whilst closing early should be motivational, be careful not to demotivate staff by leaving them hanging, not knowing exactly when they will be able to go home. Lots of organisations choose to relax their dress policy at this time of year, inviting casual dress and Christmas jumpers, especially on Christmas Jumper Day, which can help bring some fun into the office. Be careful about the wording you use when notifying staff of this to ensure it is clear that casual and Christmas dress is optional. Be sensitive to employees who do not celebrate Christmas. If casual dress worn by staff on the days between Christmas and New Year has become a problem, make sure you flag up what dress code is required ahead of time so that staff know what you are expecting. Christmas is the time when many organisations start receiving gifts from grateful suppliers/customers. Whilst we all enjoy the odd box of chocolates, it’s worth reminding staff of what is an acceptable gift. Rather than assuming £10 is the acceptable limit, make sure you check your own policy and inform staff accordingly. If you don’t have a Bribery Policy or Guidelines around receiving gifts, this could be a good time to implement some! Don’t get irritated with staff who don’t share gifts with colleagues, or let you know what they have received if you have never published a policy that clearly sets out what is required and acceptable. The Christmas party should be a great opportunity for some fun team building! 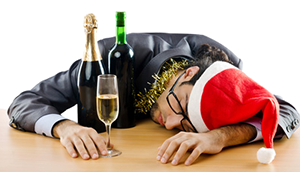 However, in reality, 90% of employers have experienced an issue arising from a Christmas party and 10% of employees know someone who has been disciplined or dismissed for an incident connected to a Christmas party – so it’s not all harmless fun! To make sure everything goes smoothly, you might want to be clear about your behaviour expectations perhaps via an email or note. Be clear that whilst you want everyone to have fun, the normal standards of professional behaviour apply and anyone who does not maintain professional behaviour may be dealt with formally. If you need help with writing your email or writing any policies around behaviour, do let us know as we would be delighted to help. If one of your employees makes discriminatory or offensive comments, or even just gossips about another employee, there is the risk that you could receive a claim and be liable for their behaviour. Ensure everyone is familiar with your bullying and harassment policy. Refer employees to your social media policy as not everyone will appreciate party photos being posted on Facebook etc. You might also consider designating a senior person to avoid alcohol during your celebration. This will ensure that someone remains vigilant throughout the occasion. To reduce the impact of alcohol, make sure you provide plenty to eat, have lots of water available and consider a cut off time at the bar if alcohol is free. To minimise the risk of any religious discrimination claim, be considerate of all staff when planning parties including the day and time, theme and catering arrangements. Be wary of any backlash from staff if you minimise risk to such an extent that the event stops being sufficiently ‘Christmassy’. Often demotivating staff is actually easier than motivating staff! It is not uncommon that staff phone in sick the day after the Christmas Party. Often they are genuinely sick, but primarily as a result of their own stupidity in drinking or eating to excess. To minimise sickness, be clear in advance what you expect of staff and how sickness the day after the party will be managed. Although there probably isn’t a high chance that we will have a white Christmas in 2015 – there is every chance that at some point during winter, your employees will encounter issues either weather or transport related when getting to/home from work. As in previous years, we recommend you put a clear policy in place regarding adverse weather so that staff are absolutely clear about your expectations e.g. will home working be permitted, can staff take holiday, will unpaid leave be given and so on! If you don’t yet have a policy in place, let us know, it’s time to draft one! Contact us. Jaluch is open for business between Christmas and New Year, we’re always here to help with any staffing headaches or, in the worst case scenario, any dismissals. If you’re feeling positive and want to crack through some paperwork, why not enlist our support to get any employment policies or contracts currently buried in your inbox and in need of review, ticked off your to-do list before we hit January 1st? Do you have year-end coming up? And need to use your budget? We would be happy to discuss any training requirements and offer various options around billing for HR, Training Services or for purchasing our pre-packaged courses ‘Bags of Learning’. If you need our help please call 01425 479888 or email us.